This week, while I was drinking a new bottle of beer, I read the bottle and saw, to my delight, a recipe printed on the label. The beer was Pumpkin Ale, brewed by Badger, and the recipe is for a Pumpkin Ale Soup. First the beer. It’s a gorgeous autumn beer; flame coloured, smoky and spicy. It’s warming like a bonfire with a rich aroma which almost becomes whiskey-like, there’s some earthy spice, a roasted-fruit sweetness and there’s a hint of a wheat beer about it. The mouthfeel is creamy and smooth and the taste is biscuity to begin then the earthy hops come trick or treatin’ with a vegetal sweetness. It’s a really good specialty seasonal. So with the beer drunk in the week, I made the soup today. Now I love butternut squash soup (check out a brilliant recipe here) and pumpkin ain’t all that different. The beer bottle recipe is simple and precise, all squeezed into a few lines of small text. All that was asked here was to boil pumpkin and potato, then add it to onions, chili, garlic and curry powder, then pour in some stock, a glug of the beer and simmer before blitzing and serving. Easy as pumpkin pie. I pretty much followed the directions, except I cut out the middle man and cooked the pumpkin straight in the stock, and I didn’t add potato because I got a big pumpkin. The result, unfortunately, were slightly disappointing. There was a bitterness which didn’t quite work and the soup was a lacking a sweetness. Perhaps I added too much stock, or perhaps I over-seasoned it, I don’t know. It was perfectly edible, don’t get me wrong, just not delicious. I tried adding cinnamon and honey as pumpkin-friendly flavours, but they couldn’t pull it together. I think butternut squash would be a better choice of veg as it’d add a rich, velvety thickness to the soup. One positive was that the beer itself worked very well with the soup; the warming, creamy-smooth beer and the hot spiced soup sparked off against each other nicely. I’ll probably try it again; I liked the beer so much I bought some extra for the cupboard. And top marks to Badger brewery for this; I think it’s the first time I’ve seen such a thing on a bottle of beer. I am a bookworm, and one of my favourite things to do is walk around second hand book shops. Many of the books I own are secondhand - some of the copies are sharply new, while others are musty and yellowing with crumbling hard covers - but I buy them because each book carries its own story, and has its own history outside of the one printed on the page. There may be physical reminders of its previous life – smudges, tears, fingerprints, even a photo or receipt – or it may just carry the idea that someone, somewhere has looked over the words before me, but I find it all rather romantic and intriguing. I never shop with a book in mind, but I am always interested in the old cookery books. Shopping this weekend, I found a book imaginatively called Cooking with Beer, written by Carole Fahy in 1972. The cover looks all of its 36 years and there are a scattering of pictures inside (one of lobster on a silver platter and another of a fondue, both classic 70s). This book is an odd one. As someone who likes to pair food with beer I am always interested in recipes actually containing the good stuff, so as soon as I found this book I picked it up and popped it under my arm. Later, sitting on the beach drinking a cool pint in the warm sun (perfection itself), I read through the book and, well, I never would’ve dreamt of so many recipes! Firstly, the beer styles are separated into Pale Ale, Mild or Brown Ale, Stout and Sweet Stout, Old Ale and Lager. There are no mention of individual beers in the recipes, just whether one requires, for example, ½ pint of sweet stout, or 1 cup of lager. Many of the recipes are classics: carbonnade, stews and casseroles, a beer batter, beer bread and rarebits. 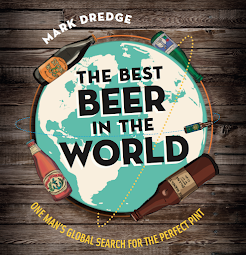 None of these would be out of place in any cookery book, modern or old, and as timeless a drink as beer is, the recipes which feature it at their heart remain constant. Then there are some more unusual recipes: melon in beer, the alliterate bass boiled in beer (apparently, ‘you will find white fish, shellfish or even oily fish – whichever is your favourite – more exciting when cooked in beer’), cassoulet, beer ratatouille, beer scrambled eggs, beer potatoes (potatoes deep fried in the beer batter), a lager salad dressing, and the intriguingly named cheese muff, beer puffs and English monkey. But then there are the recipes which are, to put it politely, interesting: beer soup with milk (brown ale, milk, eggs, sugar, cinnamon lemon and salt), beer omelet, banana welsh rarebit, and then the dessert section which includes a cheesecake with beer and suggests in the intro to ‘try experimenting with a little light ale or lager poured over your own fruit salad mixture’ – lager and fruit?! Sounds like a cocktail to me! I’ve had a long weekend of excess, spread across the south-east of England in London, Brighton and Whitstable. Lauren (my girlfriend and chauffeur) and I had some ‘us’ time, which generally means I walk around the shops with her and then she sits opposite me in the pub and pretends to be interested while I talk about beer. The first London stop, post-tourist fun, was the Fox and Anchor in Clerkenwell. This is one of the best pubs I’ve been to in recent memory: large choice of perfectly kept beer served in shiny silver tankards (although these did affect the aroma of the brew and made it tinny); a quirky snaking shape which leads back into small booths; and a food menu which features pies and scotch eggs as bar snacks (I love bar snacks – they are, for me, one of the gauges of a good pub). I had a pint of Adnam’s Old Ale which really was a thing of beauty. Next we visited the Gunmakers, the pub run by this blogger and a fellow member of the British Guild of Beer Writers. Customers were spilling out onto the street and inside was buzzing. My pint of Timmy Taylor’s Landlord was super. The food menu was stomach-rumble-inducing, but we had a dinner reservation to meet. Dinner was at Comptoir Gascon, which is pretty much right slap-between the Fox and Anchor and the Gunmakers. It’s a French deli-come-bistro which was serving one of my utter favourite dishes sur le monde: cassoulet; thick and sticky with duck fat, creamy with the beans and full of juicy meat. Food to die for, literally. London done, we moved on to Brighton and the pub of note was the Basketmakers Arms, a Fuller’s-tied house just off the hippie-chic-smoothie-lined streets. The beer couldn’t be better kept and their range featured almost all of the Fuller’s brews, plus two Gale’s beers (including HSB, which harks back fond memories of the pub quizzes at the Beehive Royal Holloway University) and an autumn seasonal called Red Fox (which was stunning and both red and foxy). The sunny Sunday was spent by the sea in Whitstable. The main purpose was to walk off the excesses of Friday and Saturday, but I had ulterior motives as it is also home to one of my favourite pubs: the Whitstable Brewery Bar, which juts out onto the pebbled beach and serves the beer spanking fresh from the brewery (the oyster stout is magical). The only downside to the weekend was missing X Factor (read: Cheryl Cole on X Factor). So Pencil&Spoon has been around for over a year now and I’ve decided to change a few things. From now on Pencil&Spoon will live its life as a ‘proper’ blog as opposed to a website. I don’t know enough about these computer thingies to keep up a website, so this is the future. The old stuff will remain because it’s taken a lot of finger-tip-tapping to get all that on there, and I’ll be honest, I’ve grown rather attached to it over the last year. Pencil&Spoon (the website, not the blog) is not changing and there’ll still be recipes, beer, tasting notes and food and beer pairing, just now there will be more of it in smaller, tasty chunks. I also have another blog now (I’ve been busy and needed the P&S downtime to sort myself out a bit! ), with the glorious address of www.markdredge.blogspot.com. It does have a pseudo of Fade Out Boy and this is me trying to become a screenwriter (I also talk a bit about beer over there).